Fare thee well, Society Hill Playhouse. 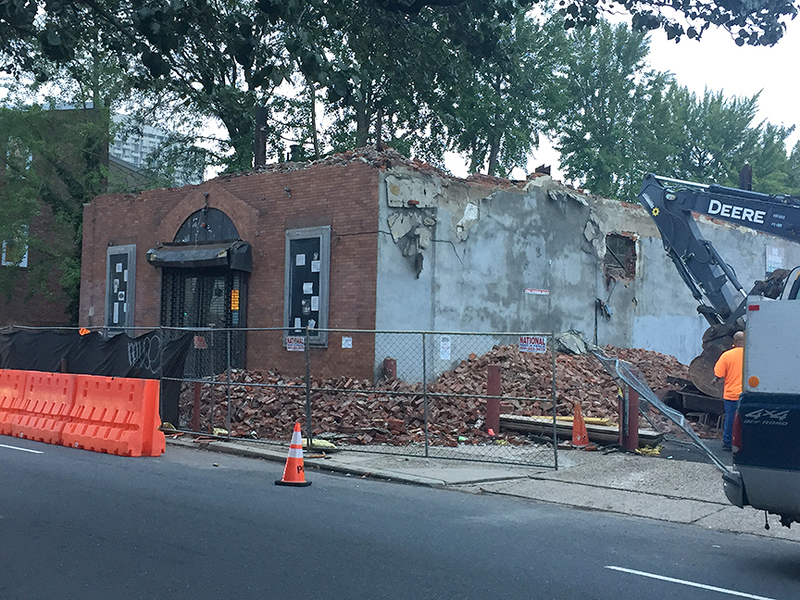 Back in the summer of 2015, we first heard the rumor that Toll Brothers would be purchasing the Society Hill Playhouse at 507 S. 8th St., and many people were apoplectic about the prospect of the building's demolition. The Toll Brothers plan went through several iterations as it wound its way through the community process, shifting from a five-story condo project with parking to a four story rental project without parking. Ultimately, Toll Brothers was unable to get support from the community and walked away from the project. Within a week, a new developer came forward, this time with plans for 26 units, 8 parking spaces, and a green roof. With the building permit already pulled, we can say that the project is most definitely happening, and by-right to boot. Another strong indication that it will be moving forward is the fact that the old Society Hill Playhouse building was demolished over the last couple of months. A reader sent us a rather sad image that shows the building reduced to just one story. While we're generally fans of development and density in and around Center City, it often bums us out when that development comes at the expense of a wonderful old building. We have no idea how practical it would have been to preserve the building, but it's clear that demo and new construction was going to be the most lucrative path. This building should probably have been designated historic a number of years ago, but the Historical Commission is terribly underfunded and doesn't have the manpower to catalogue and designate every worthwhile building in town. Until that department gets the funding they need, situations like this will surely happen again and again.